Back in early 2012, a brand new Jessica Rabbit shirt had been released, showing her riding a motorcycle and showing off a lot of curves. Though the image of Jessica was new, the shirt quality (a very thin material which was even stamped with a "Hanes" logo inside) was extremely disappointing at its price point. In summer of 2013, a hat was released with the same image from the t-shirt. Is the quality better than its shirt counterpart? Find out !! 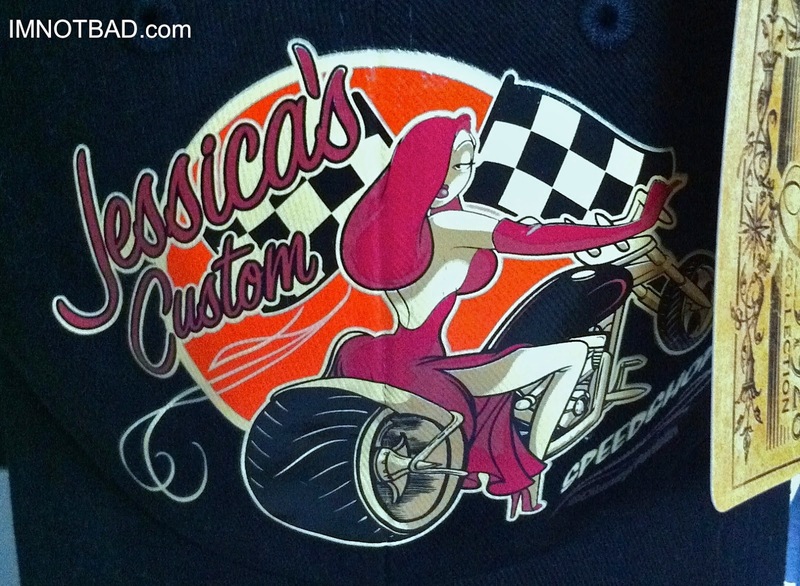 The Jessica's Custom Speedshop cap was released around June of 2013. It was widely available at several locations including Epcot, the World Of Disney Store in the Marketplace and the Gone Hollywood store in Disney's California Adventure. This cap came out over a year after a t-shirt was available with the same image. The t-shirt sold for a surprising $24.95. While it seems to be a standard price for Disney shirts, the quality of the shirt material was lacking. It was a very thin black material, marked with a Hanes logo inside. Hanes is better known for their underwear and undershirts, which is exactly what the shirt felt like. It's also confusing why the hat and shirt were released so far apart from each other - the shirt being long gone now. The two might have benefited being sold together. The newer Speedshop cap seems to get lost among other merchandise. This time around the quality of the cap seems to be far superior than that of the shirt. This, technically, is a baseball style cap. It is an all black adjustable velcroback, stitched and with eyelets for ventilation. The picture is a decal on the front of the hat. 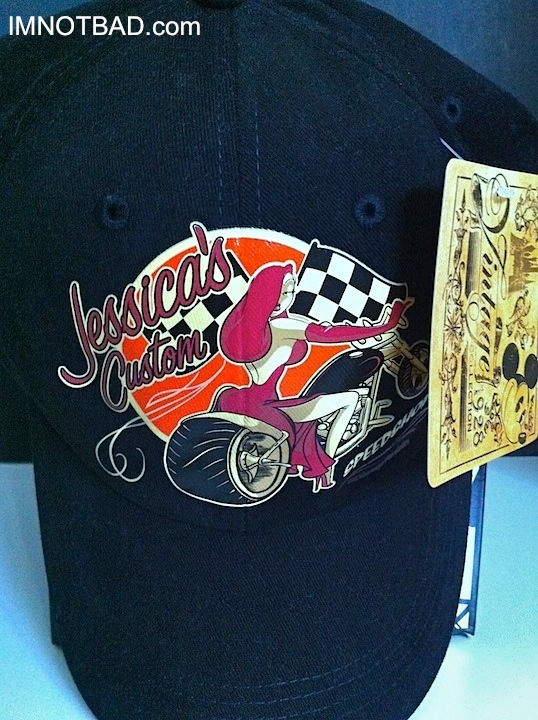 Jessica's Custom is written in front of two checkered flags and an orange circle. The word Speedshop is at the bottom. Jessica is giving an over-the-shoulder glance and wearing her usual dress, gloves and heels - but this time is straddling a motorcycle. The picture is naturally a bit smaller than on the shirt, but Jessica is straddling the motorcycle with her legs to each side, something that seemed a little risque on Disney's part to me. The other thing you can notice is that they bring attention to her backside. It is ever so slightly shadowed in the center to make it visible enough. The image is not full color but actually created in red and orange tones. Jessica's hair, gloves, dress shoes and part of the logo are red. Her skin is a light sepia. The background circle is orange. Several of the hats on display at the time of purchase had their Jessica decals ripped or perforated directly in the center where the seam of the hat material is, raising a question as to how well the decal will hold up over time. 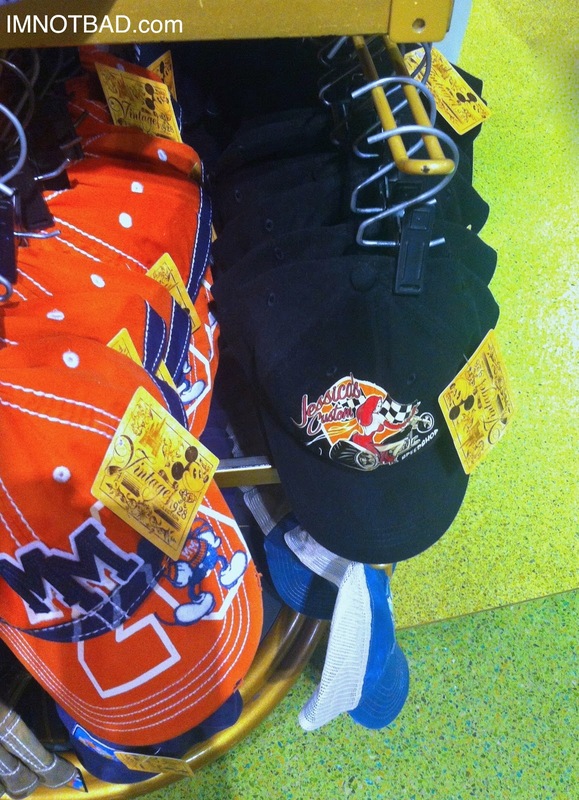 The tag on the hat shows a vintage Mickey Mouse face and Cinderella's castle, with Vintage 1928 Collection underneath. I'm not sure if that really is intended to be some sort of collection, but it definitely didn't seem to match with the hat selections the tags were attached to. The Jessica caps sold for $19.95 each. Though these were available in summer of 2013, there were still plenty left at the World Of Disney store in Walt Disney World during the holidays of 2013. 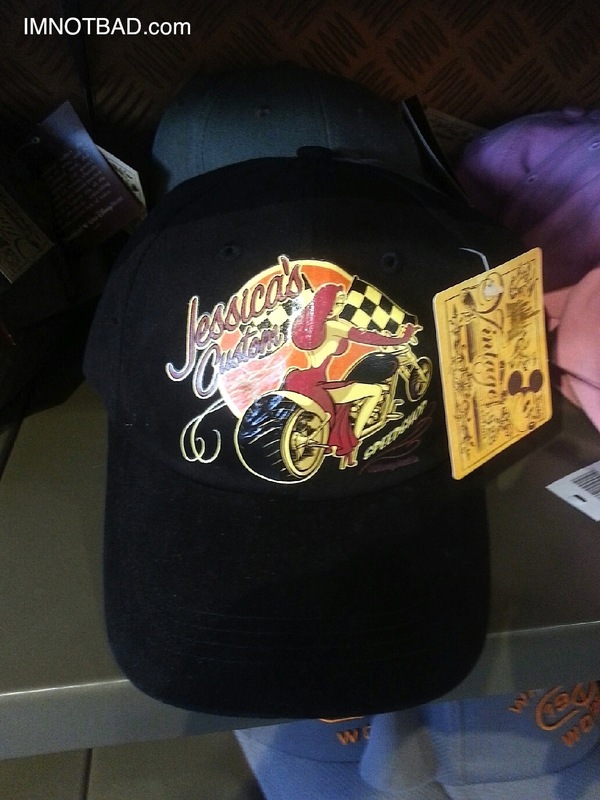 The Jessica's Custom Speedshop Hat gets a 4½. It's a fairly nice image of Jessica Rabbit. As long as the decal stays on this seems to be a good quality hat.